“Colors of the City” represents a nostalgic look back at New York City where I was born and lived for many years. The work is an attempt to capture the energy, vitality and beauty of that extraordinary place. The specific contours of two singular New York locations are explored in movement II, Oasis/Central Park, and in movement III, Boogie Down Broadway. In a sense, the piece presents a portrait of a typical New York City day, “Awakening” (movement  I) and coming to life; a quiet walk through Central Park, and ending in an exploration of the color, light and intense human excitement of Broadway. It is an homage to New York City, metropolis of the arts and an inexhaustible source of musical inspiration. Colors of the City was commissioned and premiered by Branimir Slokar and Mayumi Shimizu. Slokar is one of the most noted and revered European trombone soloists, orchestral players, chamber musicians, and teachers. The extensive list of his former pupils who occupy positions in top European orchestras is most impressive. Included in this list is Ms. Shimizu, currently principal trombonist in the Southwest German Radio Symphony Orchestra, Baden-Baden, and Freiburg. 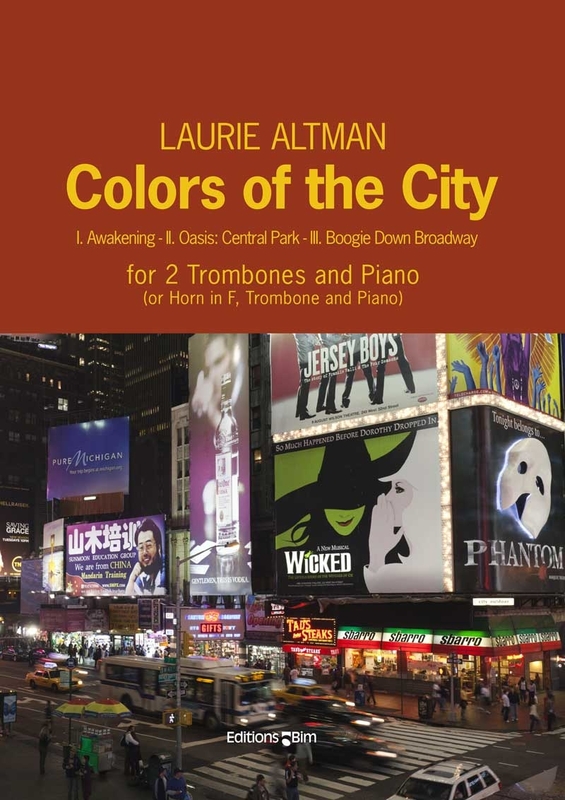 The combination of two trombones is quite unusual in terms of available repertoire, so the publisher has also included a version for horn, trombone, and piano. The two solo parts are more or less equal, the trombone does not take a back seat in this version and it opens up additional performance opportunities. This is good, interesting, and engaging music, in a jazz steeped idiom. There is no improvisation involved and the technical challenges are not beyond a good upper level college music student. It does however require excellent control, good rhythmic skills, and a conversant knowledge of jazz styles and colors. As is the norm for Editions Bim publications, the paper quality, printing, and artwork are all first class.